It’s official. Donovan McNabb has changed careers and joined the NFL network along with former players LaDainian Tomlinson, Darren Sharper and Shaun O’Hara. The network made the announcement on Wednesday, September 5th. PFP Sports & Celebrity Talent Agency recently secured three sports legends for a charity fundraising event in the midwest – basketball Hall of Famer Clyde Drexler, football Hall of Famer Thurman Thomas and baseball pitching great Jack Morris. The event began with a VIP reception followed by dinner and a q&a session. The next day, the legends participated in a golf tournament and kids’ sports clinics. 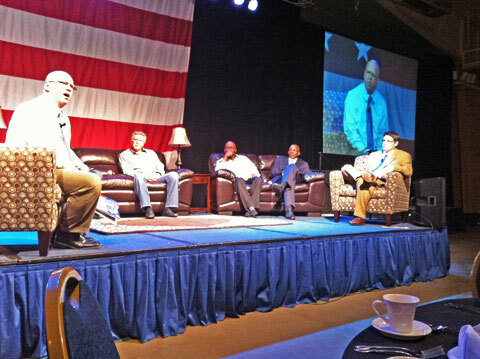 More than 1,000 people attended the dinner and the golf tournament required the use of three different courses to handle the crowd. PFP Sports & Celebrity Talent Agency recently secured three sports legends Thurman Thomas, Clyde Drexler and Jack Morris for a charity fundraiser in the midwest. 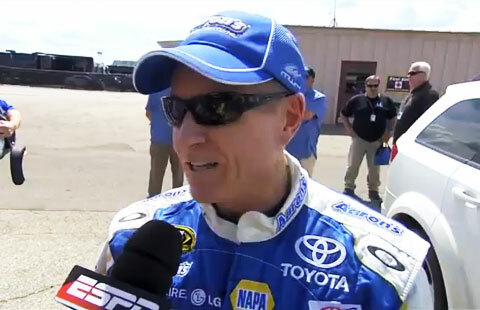 In a violent crash that took place on August 19, 2012 in Brooklyn, Michigan, NASCAR driver, Mark Martin, is lucky to be alive today after his car brutally slammed into the end of a short, narrow barrier on pit road during the first half of the race at the NASCAR Sprint Cup Series Pure Michigan 400 at Michigan International Speedway. Mark Martin walks away from violent crash at Sprint Cup Series Pure Michigan 400 at Michigan International Speedway after nearly being impaled. He is lucky to be alive. Misty May-Treanor Gets Her Own Wheaties Box But What About Kerri Walsh Jennings? Who is this year’s “Breakfast of Champions”? It’s Misty May-Treanor and Michael Phelps. But what happened to Kerri Walsh-Jennings, the other half of the winning women’s volleyball Gold medal team? Misty Mae-Treanor, Michael Phelps get their own limited edition Wheaties box on Aug. 16, 2012. LONDON — The U.S. women’s soccer team received redemption Thursday in the 2012 Summer Olympic games after defeating Japan 2-1 to capture their 4th gold medal out of 5 Olympics. Star players Hope Solo, Abby Wambach, Alex Morgan and Carli Lloyd, along with a well coordinated team effort, contributed to the Olympic championship. 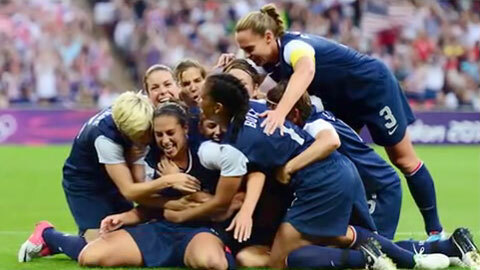 U.S. women’s soccer team celebrate their 2-1 victory over Japan on August 9, 2012 to win their fourth Olympic Gold medal in the 2012 Summer Olympic games in London. Was Lola Jones Fourth Place Finish in 100 Meter Hurdles Affected By Negative Media? After Lolo Jones finished fourth in Tuesday’s 100-meter hurdles, an emotional Lolo Jones fired back at the media on Wednesday. Jamaican sprinter, Usain Bolt, winner of the men’s 100 meters at the 2012 Summer Olympics in London, recently showed a classy side to his usual fun and laid-back personality. 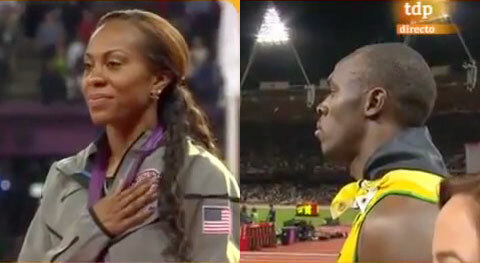 As American runner, Sanya Richards-Ross receives the gold medal for the women’s 400 meters at the 2012 Olympic games, Usain Bolt stands in silence as the US National Anthem is played. The Pro Football Hall of Fame class for 2012 was announced on Saturday, August 4, 2012 in Canton, Ohio. The inductees included Jack Butler, Dermontti Dawson, Chris Doleman, Cortez Kennedy, Curtis Martin and Willie Roaf. This 2012 NFL group of previously unsung men have finally been acknowledged and recognized for their past achievements.